Can an obnoxious, sadomasochistic nerd be the central character of a play? This is the thought that will run through your mind as you watch Jesse Eisenberg’s third play, The Spoils, being given its world premiere by The New Group. As it turns out if you knew Ben, the latest role Eisenberg has written for himself, you would probably run the other way. However, staged by The New Group’s artistic director Scott Elliott, The Spoils is absorbing theater and you sit riveted to see if Ben will get what he deserves. When we first meet Ben, we discover that he is a trust fund kid living in an enviable Manhattan apartment paid for by his father. He has been kicked out of New York University’s film school, but considers himself a filmmaker though he has no body of work to back up this claim. Having no friends, he has taken in a fellow NYU graduate business student from Nepal, Kalyan (Kunal Nayyar, from The Big Bang Theory in a likeable and sympathetic role), as a roommate rent free mostly as a companion. The affable Kalyan puts up with everything from having his homeland insulted to Ben going after his Indian American girlfriend, an ambitious medical resident Reshma (a steely, ambitious Annapurna Sriram) verbally with a hatchet. However, as soon as we meet him, Ben shows his true colors. He is boorish, insulting, self-absorbed, socially inept, jealous, vindictive, self-loathing and obnoxious. Why the nice, friendly Kalyan puts up with him is anyone’s guess, other than that Ben is saving him a great deal of money. Could it be that he realized how emotionally needy Ben actually is? Eisenberg became famous playing the socially awkward, nerdy Mark Zuckerberg in The Social Network, and in each of his own plays, Asuncion and The Revisionist, he has refined this character into the sociopath that Ben proves himself to be. The plot of the play revolves around Ben meeting a former high school classmate Ted (the affable and friendly Michael Zegen, from Rescue Me and the last season of Boardwalk Empire) and discovering that he is just about to marry Sarah, Ben’s silent high school crush. (Ben’s only intimacy with Sarah was a dream that he has never told anyone about but is dying to get off his chest.) After Ted and Sarah come for dinner, Ben decides to make a play for her and get her for himself – including all the lies about his life that that will entail. You may find the play’s ending a little unbelievable as it attempts to humanize Ben, but it is certainly one cap to the story. 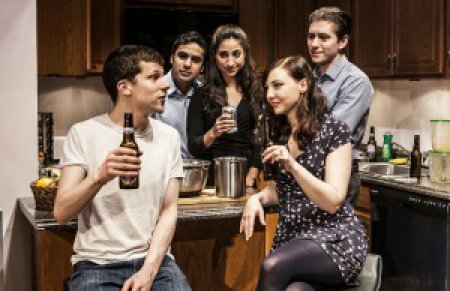 If The Spoils reminds you of Kenneth Lonergan’s This Is Our Youth, that play defined a generation of stoners, while this play is more about community among young people finding their way in their chosen professions. Darke’s Sarah is a committed teacher working with teenagers in prison, Sriram’s Reshma is a doctor ambitious to find her specialty and help people get well, Zegen’s Ted and Nayyar’s Kalyan want to have successful careers in business and economics. Only Ben can’t get his act together but takes out his frustrations on everyone around him. It is remarkable how sympathetic director Elliott makes all of the other characters as foils to Ben’s problems. Eisenberg is superb in this role; however, one suspect he has taken this character type as far as he can go without playing an out and out villain. Derek McLane’s setting for Ben’s attractive luxury apartment resembles many others in plays this year, obviously the correct pad for the upwardly mobile protagonist. The costumes by Susan Hilferty beautifully define the five character types. Peter Kaczorowski’s subtle lighting makes the changes of time for each successive scene totally evident. The projection design by Olivia Sebesky and the fight direction by UnkleDave’s Fight-House are exactly what is needed for this story. 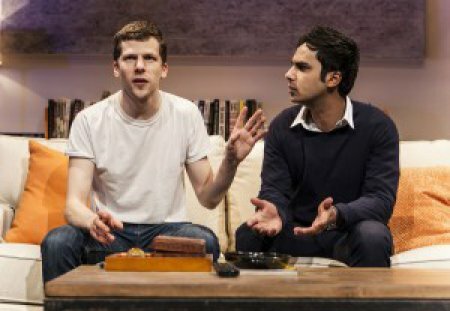 Jesse Eisenberg’s The Spoils is about a person you would not want to spend any time with, Ben proving himself to be uglier than sin, but under Scott Elliott’s fast- paced direction this story makes for riveting theater. Greg (“Slowgirl”, “Kid Victory”) Pierce’s latest play is a satire on the hot button topics of urban renewal, Chinese entrepreneurs, racism and amateurs in politics.